The NRG #200P continuous rotation potentiometric wind direction vane is a robust low cost wind vane suitable for a multitude of applications. The thermoplastic and stainless steel components resist corrosion and contribute to a high strength-to-weight ratio. 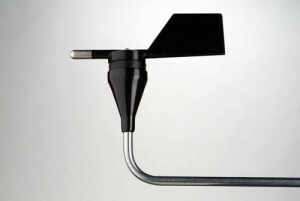 The vane is directly connected to a precision conductive plastic potentiometer located in the main body. An analog voltage output directly proportional to the wind direction is produced when a constant DC excitation voltage is applied to the potentiometer. A rubber terminal boot is included. Suitable for use in wind resource assessment, meteorological studies and environmental monitoring.